The dreamlike landscape of the red sands in the Australian Outback contrasts the vast glaciers of New Zealand’s South Island, highlighting two distinct but simultaneously immersive natural beauties. Bask in the enticing aroma of the Pacific and indulge in luxurious accommodations. Wander beneath the oldest rainforest canopy in the world and enjoy the magnificence of Uluru. Your custom tailored tour of Australia and New Zealand engages the enchanting life along the Great Barrier Reef and explosive waters of the geysers in the Waikato Region, each accentuated by impressive views of white sand beaches and reflective freshwater lakes, magnificent waterfalls and shimmering seas speckled with passing sailboats. The highlights of Australia and New Zealand emanate from the splendors of the land and sea, embodied in captivating culture and contemporary comforts. 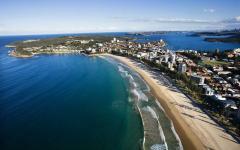 Your 15-day exploration takes you first to Sydney, Australia, where the iconic opera house overlooks the harbor waters. Your private transfer meets you at the airport and escorts you to a luxurious hotel in the heart of the city. The remainder of the day is yours to enjoy the cosmopolitan atmosphere blending with the unique beachside ambiance. 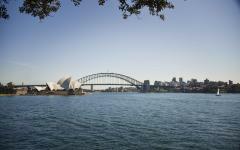 Visit the Royal Botanic Gardens or spend time exploring Darling Harbour. 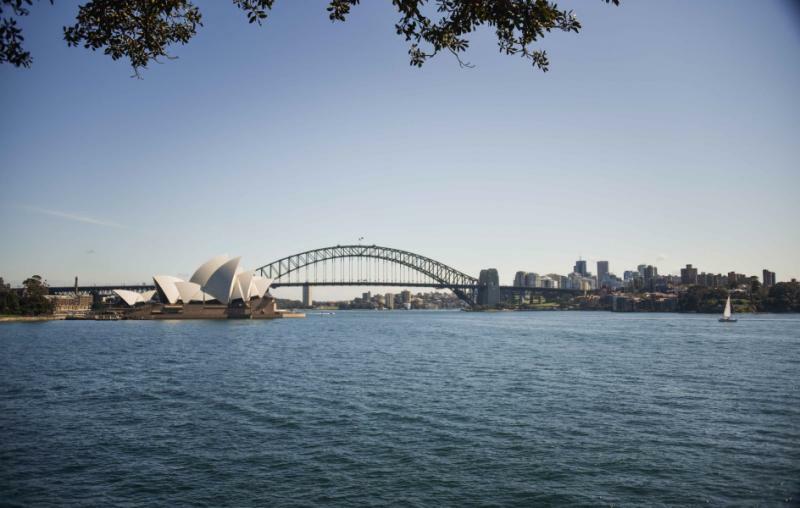 The next day, your guide takes you on a half-day tour of the city’s sophisticated and exciting neighborhoods, from the historic Rocks District to Bondi Beach. 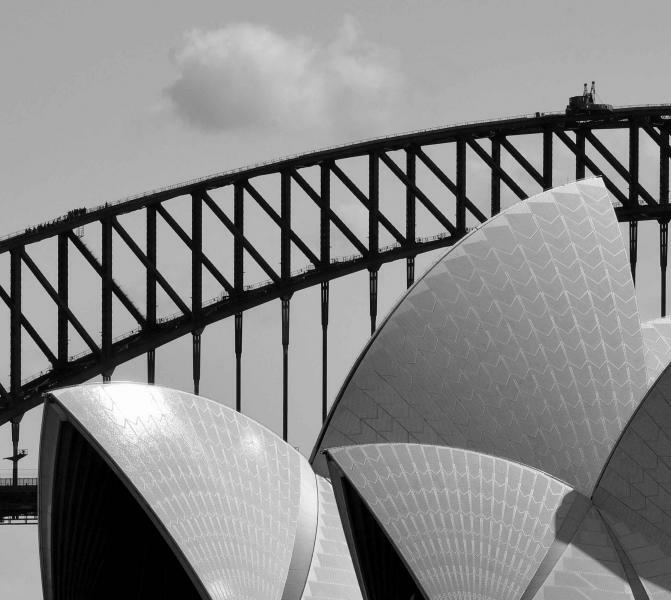 Spend time wandering through the concert halls and theaters of the Sydney Opera House on a private tour. Next, your private transfer meets you in the hotel lobby and escorts you to the airport for your flight to Uluru, located in the Red Centre. You travel from the airstrip to your stunning resort-style accommodation overlooking celebrated Uluru. In the evening, you can watch the colors shift across the rock face and learn about Aboriginal culture and art. Wake up before dawn to enjoy a sunrise tour around Uluru, to see the rock art and niches of the ancient monolith. In the afternoon, you continue to Kata Tjuta to traverse the trails before dinner beneath the stars, listening to the story of Dreamtime. Transfer to Cairns, in northeast Queensland. 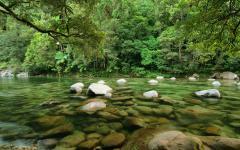 Your private transfer leads you to a gorgeous lodge along the banks of the Mossman River. Wander the trails in search of butterflies or traverse the waters on a canoe before the day ends amidst the jungle canopy. Your naturalist guide meets you after breakfast and takes you on a half-day rainforest tour in search of the exotic flora and fauna of the region. 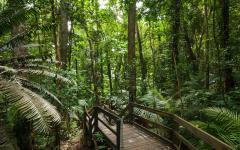 The remainder of the day is yours to search for endemic animals hiding in the underbrush and canopy. 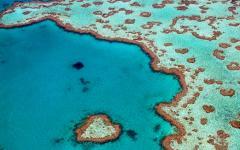 Then, you have a scenic flight from Cairns Airport to the secluded shores of Lizard Island. The majestic resort stands alongside crystal clear waters. The island is yours to explore; take to the edging coral reef with a snorkel and fins or trek to the top of Cook’s Look. You could also relax with a day at the resort spa. 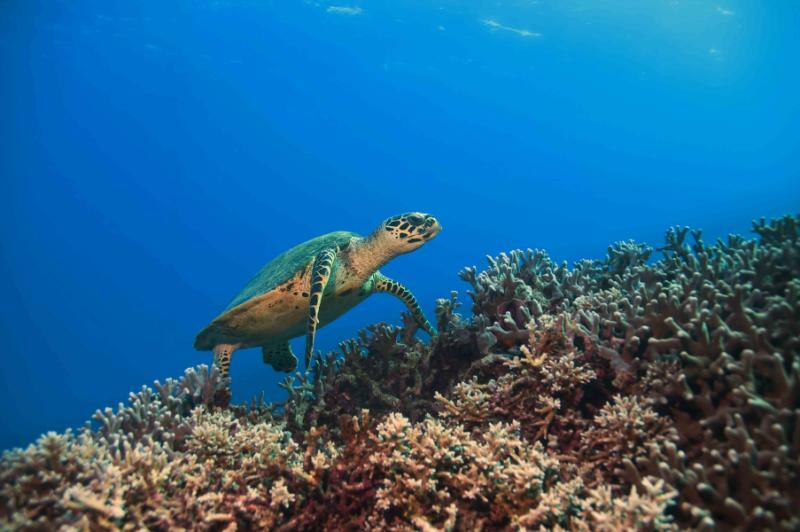 The following day, you step aboard a boat bound for the Outer Reef of the Great Barrier Reef to discover the wonders of the largest reef system in the world. Afterward, you fly from the east coast of Australia to Auckland, New Zealand. Your private transfer leads you to a stunning hotel on the waters of one of the city’s celebrated harbors. The remainder of the day is yours to explore the streets of the city and enjoy the fabulous museums depicting natural and cultural history across the North and South islands. 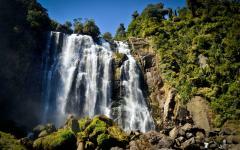 Your private transfer escorts you south towards the lakeside town of Taupo. 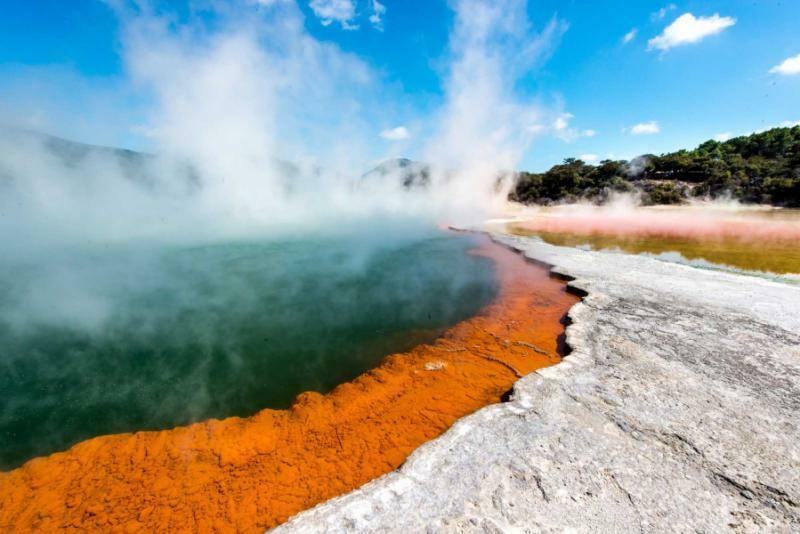 Visit the erupting geysers and steaming landscape of the geothermal highlights at Waiotapu Thermal Wonderland before reaching Taupo. Board a catamaran to bask in the picturesque scenery of town with a half-day lake cruise. You also find wondrous Maori sculptures etched into the cliffs at Mine Bay. 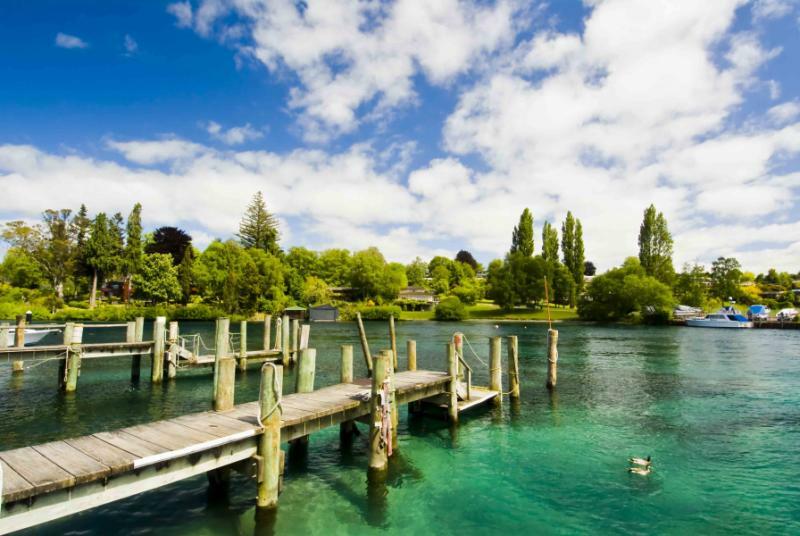 Next, you fly from Taupo to Queenstown on the South Island. After settling into your fabulous lakeside hotel, you visit the charming antique streets of Arrowtown, which boomed in the late 19th century during a gold rush. You make your way to Milford Sound and the Fiordland National Park for an unparalleled tour of the marvelous landscape. 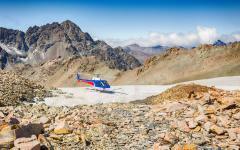 Enjoy a helicopter ride around the cliffs, waterfalls, and bays before setting down on Mount Tutoko Glacier. Your private transfer meets you in the hotel lobby on the final day and escorts you to Queenstown Airport for your flight home. Sydney is a city of movement that ebbs and flows with the tide. Beaches shimmer with opulent gold sand and turquoise water. Sailboats glide over the horizon. 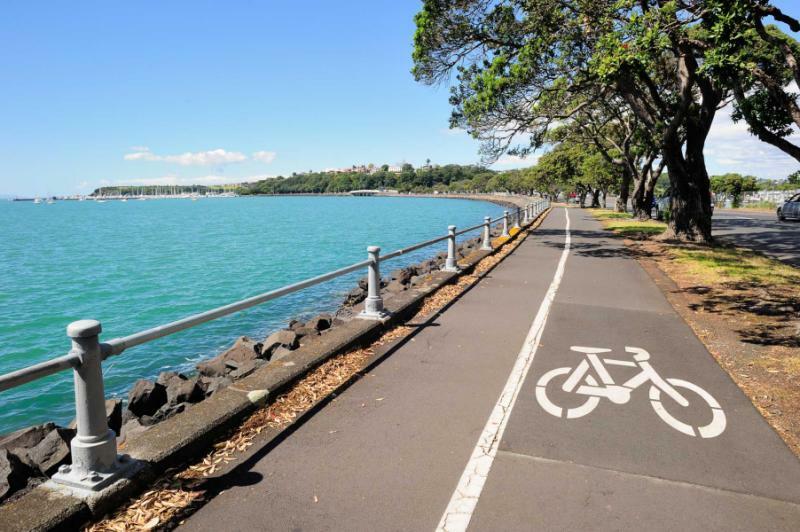 Ferries connect the surrounding suburbs with the heart of the bustling cosmopolitan ambiance in the Central Business District, referred to by locals as the CBD. History resounds in the Rocks district overlooking the entrance to Sydney Harbour with the original sandstone-brick facades in view of the contemporary arching steel frame of the Harbour Bridge. 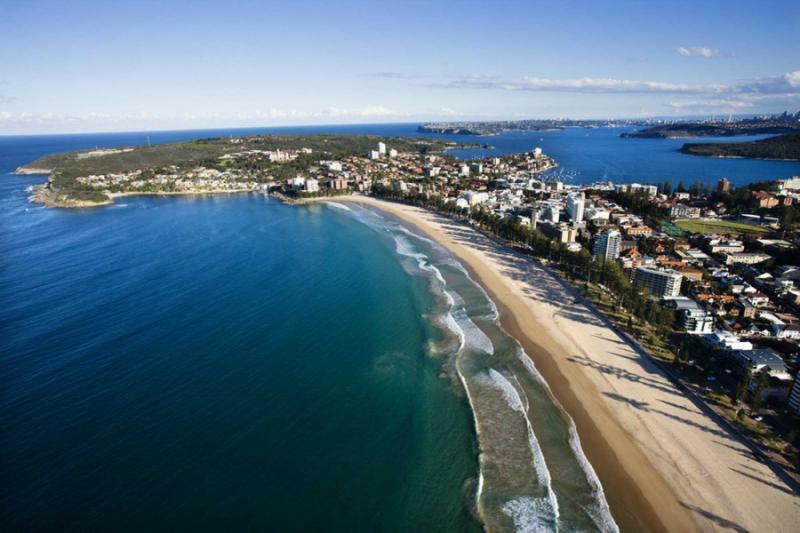 Your flight lands at Sydney Airport, where your private transfer meets you upon arrival. The detailed statue of Queen Victoria adorns the 19th-century façade of the Queen Victoria Building. The interior arcades frame antique mosaic floors highlighted by the natural light pouring through over 20 ceiling domes. Your hotel rises above Darling Harbour, providing you with gorgeous views of the waterfront and the emerald plants decorating the Royal Botanic Garden. The aroma of the sea sweeps across the brick esplanades leading to Circular Quay. After settling into the comforts of your accommodation, the remainder of the day is yours to explore the vibrant streets of central Sydney, at your preferred pace. 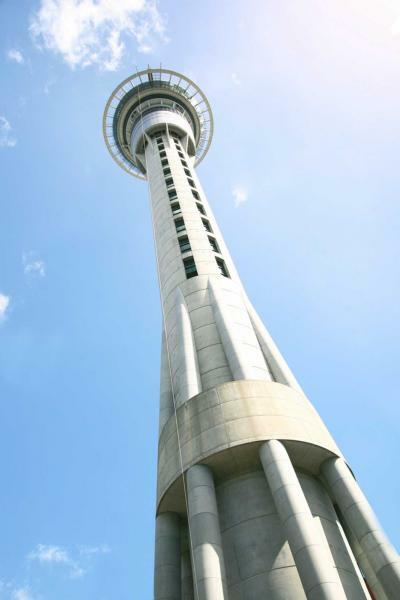 Sky Tower punctuates the skyline of the city, reaching a height of more than 1,000 feet above the active streets below. From the top of the tower, you have a remarkable panorama of the city’s surroundings brushing against the verdant shoreline. In the morning, the sunlight bounces off the masts of the HMB Endeavour, a replica of Captain Cook’s ship upon which European sailors first set eyes on Sydney. The ship decorates the exterior of the Australian National Maritime Museum located in Darling Harbour. After breakfast, your private transfer meets you in the hotel lobby and escorts you through the city on a half-day guided tour. The scent of blossoming roses and hyacinth emanates from the Royal Botanic Gardens. Cafes in the bohemian neighborhood of Newtown fill the air freshly roasted coffee beans. Locals and visitors wander along the esplanade at Bondi Beach beneath the blending aromas of fish and chips and the sea breeze. Surfers grab the waves on the turquoise water edging the small bay. The wake splashes against the rocks beneath the private seaside pool connected to the Iceberg Swimming Club. 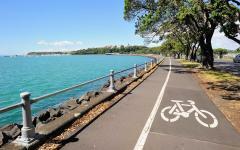 In the afternoon, you make your way along the rosy brick esplanade leading to a protruding tongue of Darling Harbour. The Sydney Opera House stands proudly as an icon of the city with a rooftop replicating the sequence of sails rising in the wind. The edifice was opened in the 1970s and contains theaters, studios, a concert hall, restaurant, and reception rooms. Your guide leads you into the halls to find open windows providing plenty of natural light and pristine views of the water. In the main concert hall, your guide claps his hands to demonstrate the marvelous acoustics inside the clam-shaped gallery. In the morning, you bask in the view of the water from your hotel room, enjoying the splendor of ferries crisscrossing the harbor between the city center and the lavish suburbs. Cyclists and joggers take to the walkway connecting Bondi Beach and Coogee, which winds along precipitous cliffs at the ocean’s edge. The scent of fresh coffee and the semi-sweet aroma of the South Pacific are never far away. 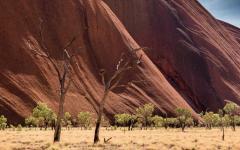 After breakfast, your private transfer escorts you to the airport for your flight to Uluru in the Red Centre. 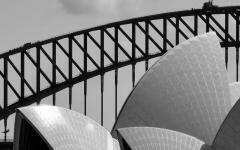 As the plane ascends into the sky, the Opera House and Sydney Harbour Bridge fade from view. The turquoise ocean and splashing waves disappear behind the expanse of rusty-red sand and verdant tufts of the Outback. Your flight lands at the airstrip, and you have a private transfer to your desert resort overlooking the majestic walls of Uluru, a monolith deeply connected to the local Anangu Aboriginal people. In the preserved desert landscape, you can hear the sounds of nature as the sun drifts past the horizon. Dingoes rustle in the grass tufts and kangaroo leap in the cooling temperature of the evening. The splendors of the Red Desert glow at dawn and dusk, spreading across the landscape with captivating colors. You wake up before sunrise and step out onto the cool sand of the early morning. The night sky glistens with stars. Your guide points to the Southern Cross, a consolation visible only in the Southern Hemisphere. You make your way to a viewing platform and find the aroma of fresh coffee rejuvenating your senses. The sunlight peeks over the flatland to the east. 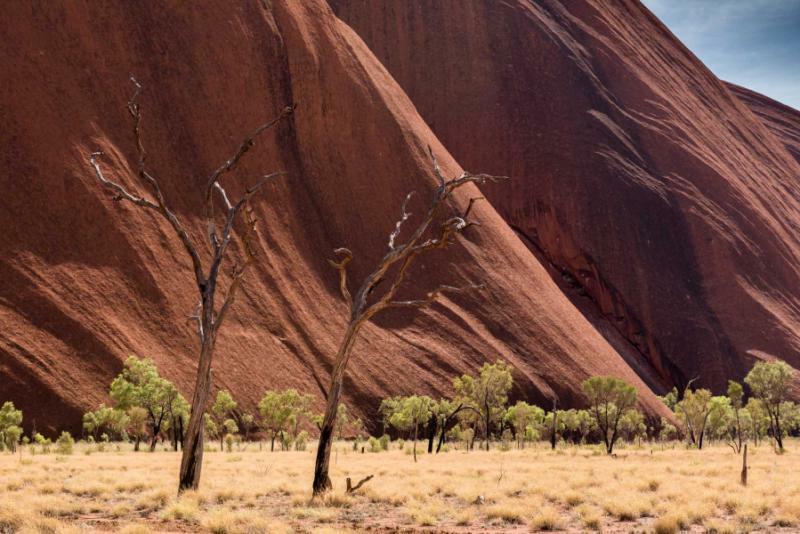 As the light spreads across the desert, you notice the colors of Uluru shifting. The monolith is approximately 600 million years old and has an elevation of more than 2,800 feet above sea level. The silhouette of the night shifts to an iridescent vermillion. Your guide leads you along the track encircling the base of the rock face, pointing out various caves and niches off limits to those not of Anangu ancestry. The tribes continue to utilize the area for ceremonies. However, your guide shows you a collection of rock paintings dating back more than 5,000 years. The scent of the packed red earth in the warming sun provides an earthen aroma. The rock is cool against your fingertips beneath the overhang. You continue to the domes of Kata Tjuta to traverse the walkways circumventing the impressive natural mounds harboring waterholes and caves that have helped maintain life in the desert heat. In the morning, you wake up early to once again view the shifting colors of Uluru, this time enjoying the natural phenomenon from the comfort of your room. Kangaroos nibble on the grass tufts near the edges of your resort and elaborate artworks crafted by local painters fill the gallery in the resort and offer deeper insight into the spiritual connection between the Anangu and the surrounding desert landscape. The bright colors grab your attention, and the detailed symbols tell stories of the Rainbow Serpent and waterholes. After breakfast, your private transfer leads you to the airstrip for your flight eastbound to Cairns. As the plane descends into Cairns Airport, you find the jade canopy of tropical rainforest blanketing the Great Range Mountains and reaching the white sand beaches framing the Coral Sea to the east. The water shimmers with layers of indigo, sapphire, and cobalt blue. 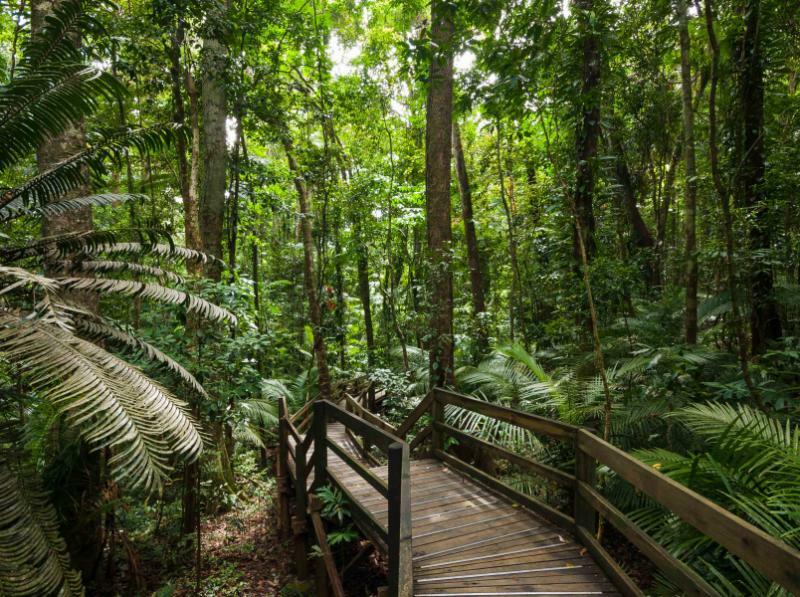 Your private transfer meets you at baggage claim and escorts you northbound to a lodge inside the gorgeous and unique vegetation of the Daintree Rainforest, the oldest tropical lowland rainforest in the world. 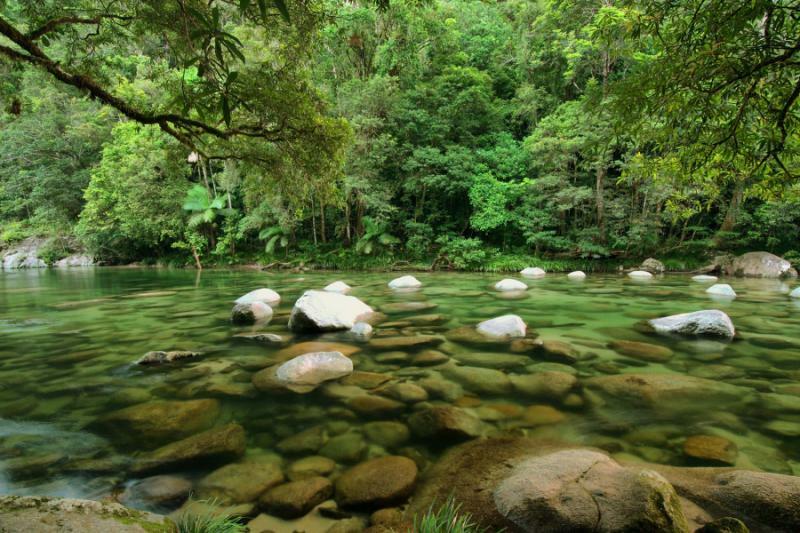 Your resort style lodge rises above the banks of the Mossman River. The serene setting provides ample opportunity to hear cockatoo call out into the canopy or frogs jostle around the underbrush. Visitors cruise down the river in canoes and relax by the elegant pool in tranquil seclusion. In the morning, the scent of fresh rain fills the forest grounds. You heard the water trickling into the river during the night. Today, the sun pierces through the canopy with vigor, casting beams of light across the forest floor. The aroma of fresh coffee accompanies the herbaceous aroma of the vines. After breakfast, you meet your naturalist guide who is eager to lead you along the trails and waterways of the surrounding jungle terrain for an unforgettable, in-depth view of Australia’s northeastern region. Vines dangle from the treetops and the river current brushes against the edges of the muddy banks. Your guide picks fresh berries from a hidden plant and offers them to you to eat. Your tongue turns dark blue from the sweet juice. Large ants form lines along fallen logs as you pass over liana vines. You find a forest dragon perched on a tree trunk. The reptile can live up to 60 years old and can grow longer than one and a half feet. Your guide points into the distant trees and tells you to keep silent. A large, flightless bird similar in size to an ostrich grazes in the bushes. Its head shines an indigo blue against the jade leaves. The elusive cassowary can grow to more than six feet tall and has a thick helmet atop its head, bringing to mind a prehistoric creature. In the morning, you find the gentle electric blue hues of a Ulysses butterfly resting against your balcony overlooking the Mossman River. The serene trickling water echoes beneath the canopy. The rosy petals of the Pink Flowered Doughwood rustle in the gentle forest breeze. After breakfast, your private transfer meets you at the hotel and escorts you to Cairns Airport for your scenic flight to Lizard Island. 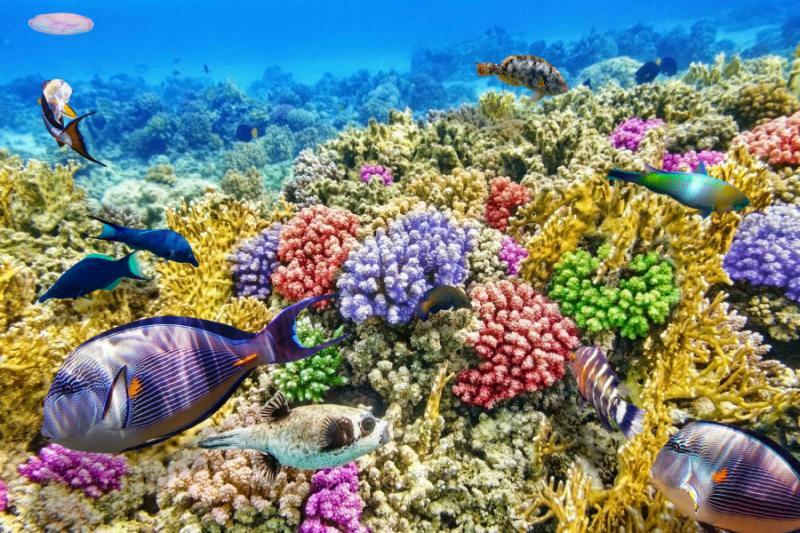 The stunning waters of the Coral Sea spread beneath you. 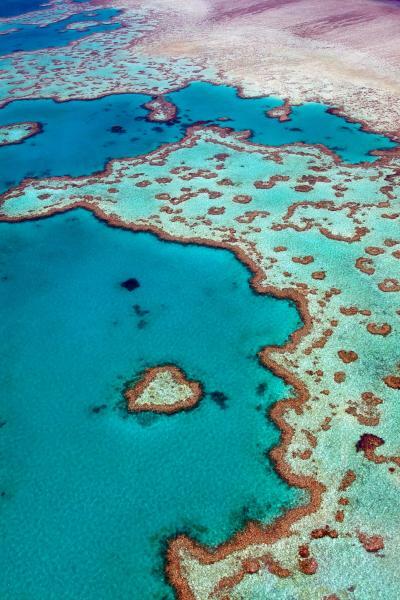 The crystal clear hues change from indigo to cobalt, with the darker spots connoting reef systems connected to the larger Great Barrier Reef. The plane lands on the airstrip at Lizard Island where you meet your private transfer. Time stands still in the comforts of your coastal resort on the secluded island. The pristine water laps against the powdery-white sands of 24 separate beaches. 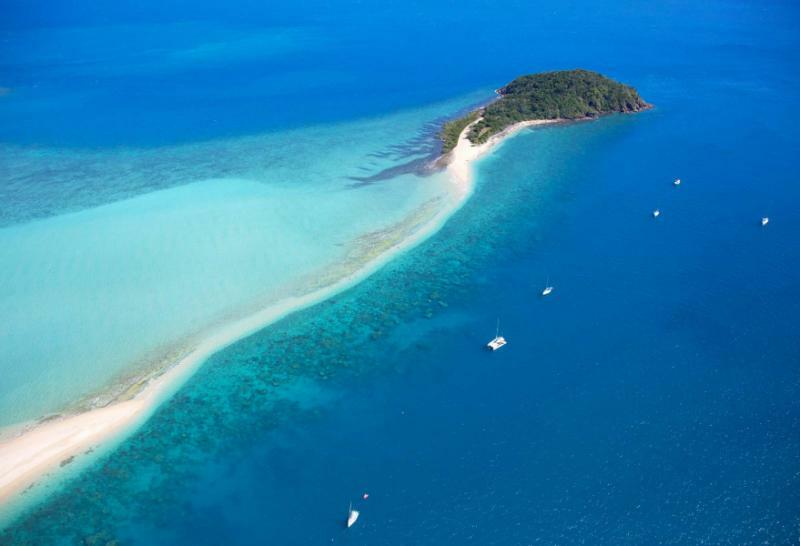 The island encompasses nearly 2,500 acres in view of coral reef gardens fringing the shoreline and is situated halfway between Australia’s east coast and the Outer Barrier Reef. The scent of fresh bark emanates from the woodlands and blends into the sweetness of the sea breeze. Grasslands sweep across small plains and rustle against the movement of monitor lizards burrowing into the cool soil. The sunrise flickers off the crystal clear waters of the Coral Sea. The white sand is soft and cool against the spreading light. At breakfast, you find tropical fruits glowing with seductive colors, such as crimson shells of rambutan and canary-yellow star fruit. 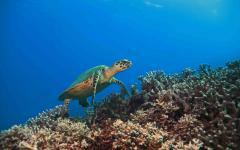 The day is yours to indulge in the natural splendor of Lizard Island at your preferred pace. Rent a paddleboard to propel yourself along the coast near the edges of the reef bodies or trek the trails meandering through the trees and prairies leading to the summit of Mount Cook. 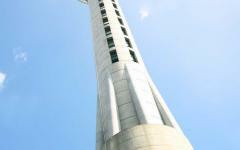 The lookout stands at a height of nearly 1,180 feet above sea level. Wandering along the trail offers pristine views of the waters shifting color throughout the day. The Coral Sea changes from turquoise to indigo near the white sand shores, reflecting the greenery of the hills. Small fishing vessels and sailboats moor in the shallow. Monitor lizards reaching a length of nearly five feet bask in the sunlight, spreading their long bodies over smooth rocks. Your tranquil view at the top of the Cook’s Look also provides seclusion for the perfect combination to enjoy the natural scenery of the island and the shimmering horizon along the water’s edge. When you descend the mountain peak, you can take to the soft shores and lounge in the mixture of comforting sunlight and warm seawater lapping against your toes. Yellow-bellied sunbirds perch atop umbrella plants to feed on the nectar in the morning light. Golden orchids blossom on the upper ridges of the island landscape. After breakfast, you board a small boat bound for the Outer Reef for a view of the Great Barrier Reef, the likes of which you have never before seen. The luxurious catamaran offers a comfortable ride along the cobalt colors of the sea. Water spouts into the air from the hull of the boat. The scent of the water sweeps over the walkways along the 51-foot vessel. The catamaran moors against the ridges of the Outer Reef. 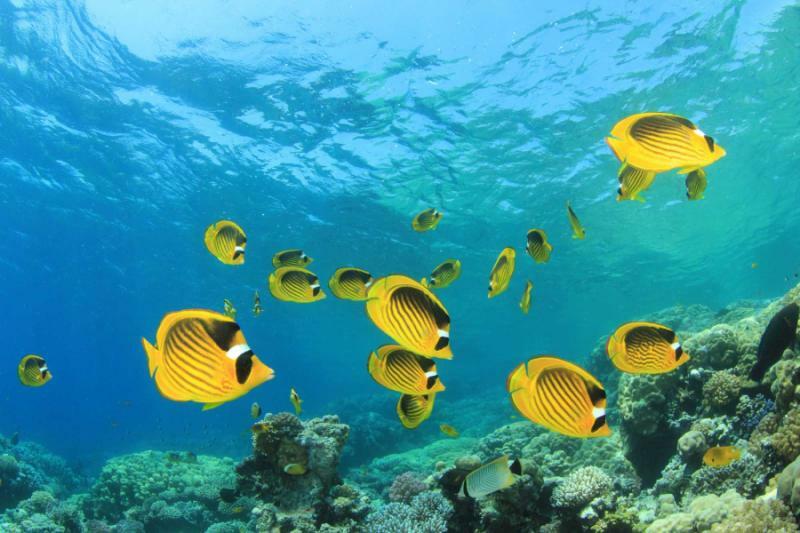 You don your snorkel and fins and submerge yourself into the water. The warmth of the sea feels inviting. The coral rises upwards from the seafloor like hills. Purple and red sea fans wave in the gentle current. Table coral branch out above seagrass. 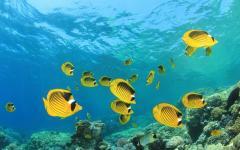 Schools of angelfish swim below you, swirling over the ridges of brain coral. An eagle ray has spots on its back and flaps its wings like a bird through the water. They can grow up to 16 feet in length and have a wingspan 10 feet. 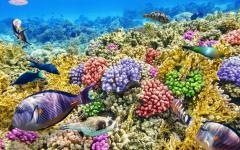 The majesty of the region is staggering when you realize the rainbow hues of the coral and vibrant aquatic life spans nearly 133,000 square miles. Your flight lands at Auckland Airport, where your private transfer greets you upon arrival. Your hotel stands on the waterfront overlooking the marina. Masts wade in the gentle wake and the water laps against the edges of the brick esplanade. The remainder of the day is yours to explore the vibrant and cosmopolitan lifestyle of the city, from the historic galleries of the Auckland Museum to a demonstration of island art at the Auckland Art Gallery. You make your way to Goat Island Marine Reserve to view the marvelous preservation encompassing more than 1,350 acres. The space provides insight into the natural world of the islands before humans arrived, along with images of the region after Maori inhabitation. You can wade knee-deep into the cold Tasman Sea between meandering snapper and blue maomao. In the morning, the aroma of freshly brewed coffee and decadent pastries emanates from a local café. Students and young professionals linger at the tables filled with natural light before making their way to work. Sailboats take to the water and maneuver around the edges of the uninhabited volcanic islands around the harbor. 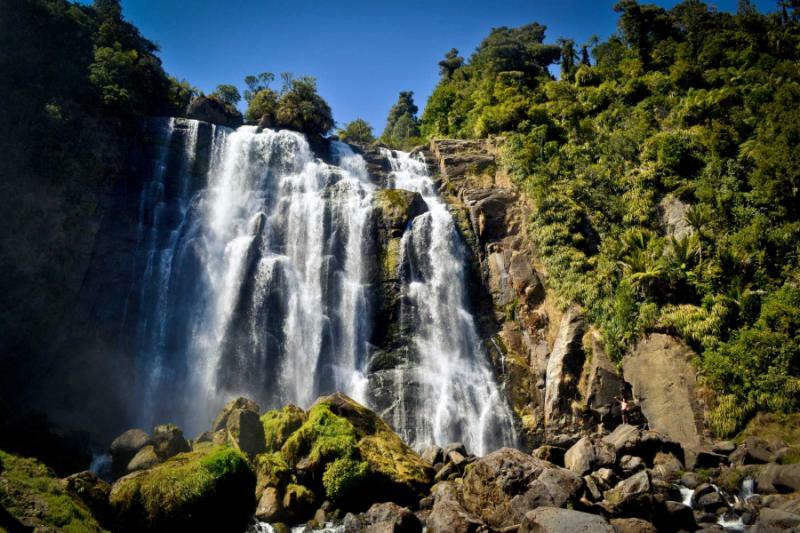 Your private transfer meets you in the hotel lobby and escorts you south towards the pristine lakeshores of Taupo, stopping first in the captivating cultural capital of the North Island, Rotorua. Steam drifts across the active fumaroles near the heart of town. 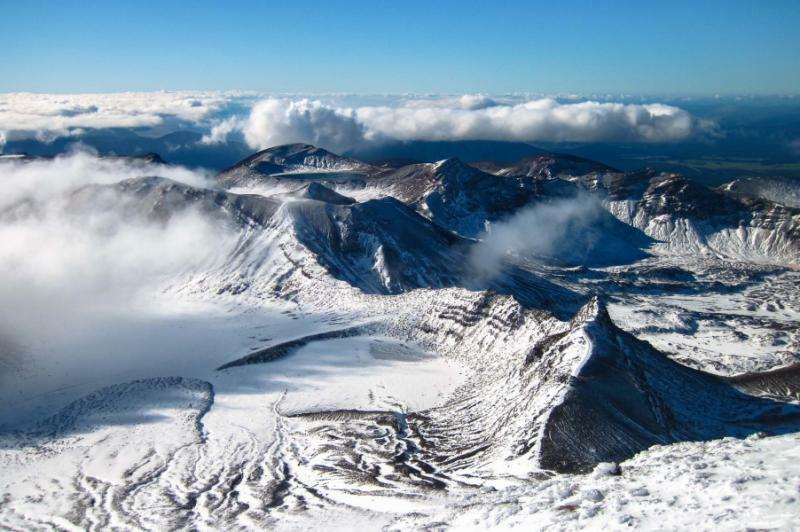 Geothermal activity has made the region a wonderland of geysers and hot springs, utilized by historical Maori communities and European settlers alike. 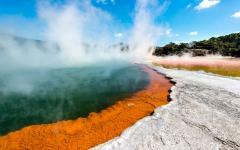 You enter into Waiotapu Thermal Wonderland, a geothermal area encompassing nearly seven square miles. Walkways lead you along the edges of the stunning landscape, glowing with iridescent greens and effervescent mud pool. You walk over a body of water steaming against the backdrop of emerald cypress and sycamore trees. Lady Knox Geyser erupts each morning at a quarter-past ten with waters reaching a height of up to 65 feet. The silica-rich water has coated the mound of the geyser, making the cone look perpetually covered in snow. In the morning, you wake up in the contemporary luxury of a vintage lodge overlooking the tranquil banks of the Waikato River. 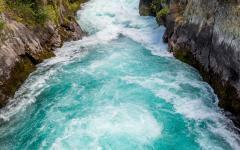 You have a vista downstream leading to Huka Falls and enjoy the refreshing air hinted with the surrounding beech trees. 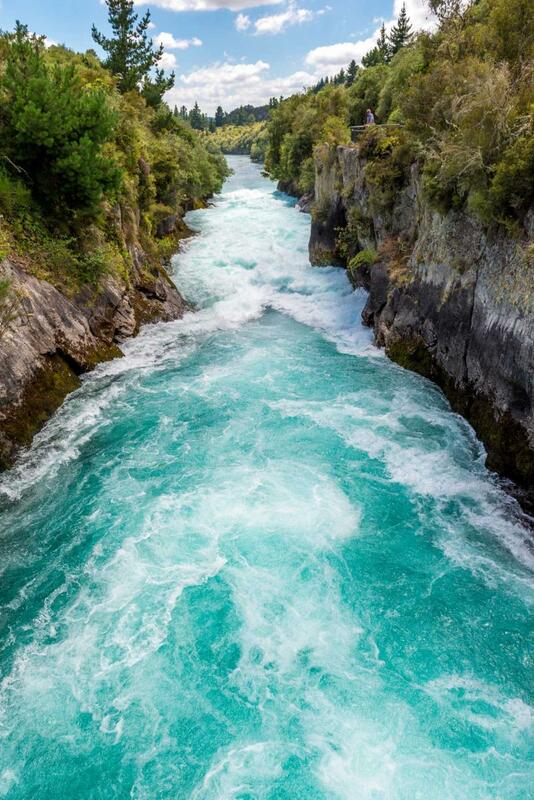 The waterfall churns with whitewater against the icy blue hues and granite borders, dropping nearly 33 feet. 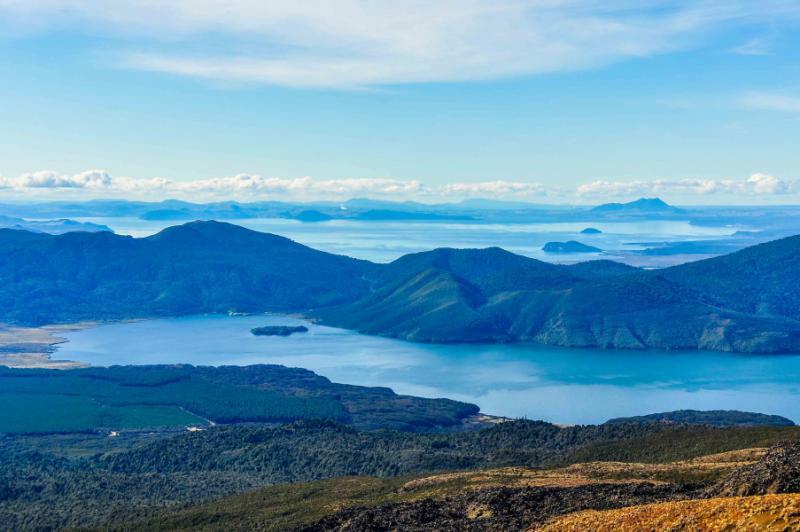 After breakfast, you board a catamaran and set out onto the reflective sapphire waters of Taupo Lake for a scenic cruise. The lake covers an area of nearly 1,350 square miles and reaches a depth of more than 600 feet. 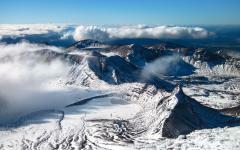 The snowy peaks of Tongariro National Park roll across the horizon. The freshwater splashes into the refreshing air as you relax on the boat offering serene views of the postcard-perfect landscape. The boat takes you to the Maori Rock Carvings at Mine Bay. Master carver Matahi Whakataka-Brightwell etched 32-foot tall sculptures into the cliffs, depicting a visionary navigator who guided two Maori tribes to the area more than a millennium ago. The art demonstrates the deep connection to nature and adds an extra layer of splendor to the already majestic landscape. Outside of Taupo, the geothermal activity of the landscape created bubbling mud pools and drifting steam rising out of the underground vents edging the lakeshore and bordering mountains. 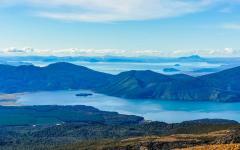 The surrounding forest hides the rising steam emanating from the popular scenic area referred to by locals as the “Craters of the Moon.” After breakfast, your private transfer escorts you to the Taupo Airport for your flight to Queenstown, a bustling, gorgeous city on the edges of Lake Wakatipu. The snowcapped peaks of the Remarkables Mountains roll across the opposite shores. Gondolas ascend the edging mountain to the summit of Bob’s Peak, at 5,735 feet above sea level. After settling into the comfort of your luxurious lakeside accommodation, your guide leads you through the charming streets of Arrowtown, a former gold-mining settlement decorated with tree-lined avenues and historic structures first erected in the 1860s. Boutique shops and elegant restaurants intersperse the antique facades and classic churches. Galleries in the Lake District Museum offer insight into the extreme conditions and the exciting influx of people from around the world during the mid to late 1800s. Gold pans and costumes help build an immersive picture of the past. In the morning, the streets of Queenstown brim with excitement. The scent of pine emanates from the forested foothills, and a cool breeze floats off the surface of Lake Wakatipu. After an early breakfast, you travel south to the shores of Milford Sound, one of the South Island’s unforgettable fiords. 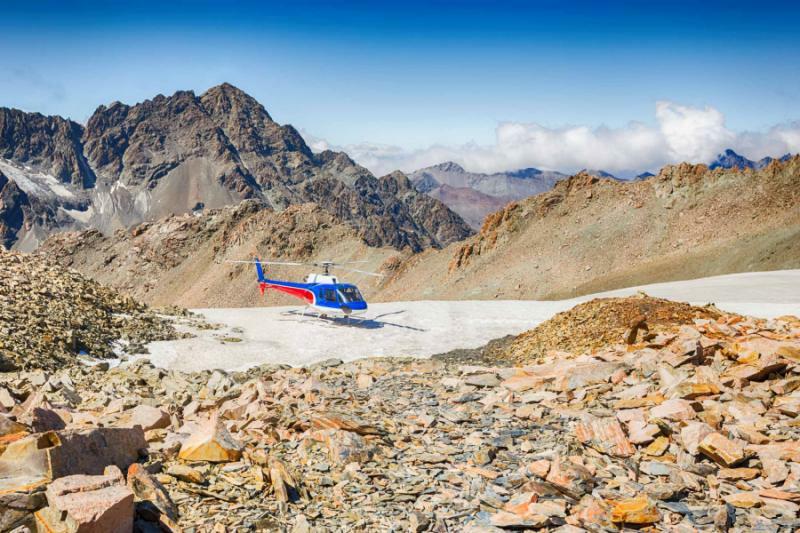 You step into a helicopter and ascend the pristine lakes, emerald forest, and stunning landscapes of Fiordland National Park. Mitre Peak stands with prominence over the calm, reflective waters. The summit stands at 5,550 feet above sea level. The rushing waters of Stirling Falls spill out over the hanging valley and into the sound. Verdant foliage clings to the granite cliffs. Snow brushes over the edges of the framing peak. The falls splashes down from a height of nearly 510 feet. You continue towards the blue-green icefalls of Mount Tutoko, with the helicopter landing directly on the glacier. The sunlight glints off the white expanse. The cold air nips at your cheeks. You dip your fingers onto the surface of the glacier to feel the granular texture of the snow. The ice field has an elevation of nearly 9,000 feet. Slivers of silver granite peek through the mounds of ice and snow, making the lush landscape of the fiord feel like a distant memory. 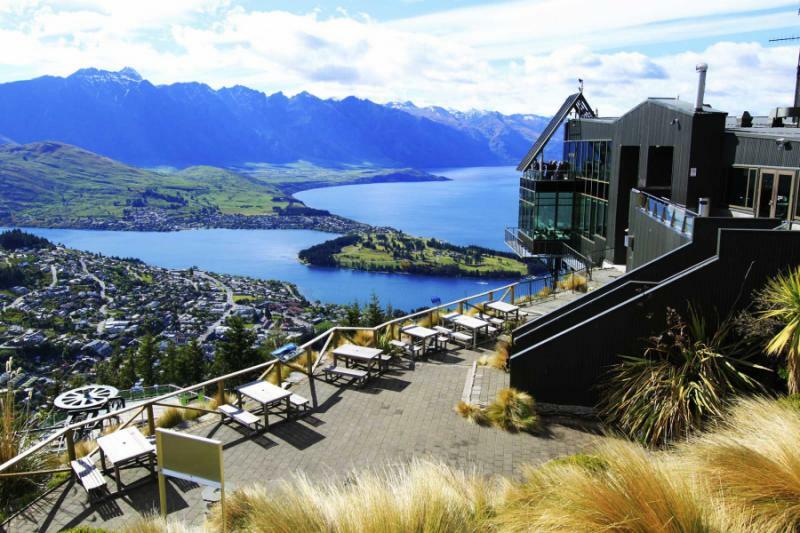 In the morning, you look out over the glistening waters of Lake Wakatipu to find the snowcapped summits of the Remarkables Mountains rolling along the southern edge. Double Cone peak, the tallest of the range, reaches a height of more than 7,600 feet above sea level, soaring above the line of trees and crystal clear waters in the foreground. At breakfast, you recall the texture of the ice on the glacier and the vibrant pastel colors of the coral at the Great Barrier Reef. 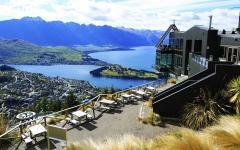 Queenstown fills with the aroma of freshly baked pastries and decadent hot chocolate. The Underwater Observatory contains six windows into the lake, where large brown trout swim alongside freshwater eels. Your private transfer meets you at the hotel when you are ready, and escorts you to Queenstown Airport for your flight home.